Many assume that Jesus was referring to the faithful (his disciples and possibly some of his followers) who would be the ones to “see” (enter in) the kingdom of God in this passage (Luke 9:27), however, if this was the case it would not had been a true statement (at least not literally) because the people that were there listening did die (literally), and the kingdom of God has not yet appeared. Since we know Jesus always told the “truth” (John 14:6, 1 Pt 2:22) we must see under what circumstance this passage (Luke 9:27) remains true. So what does “till they see the kingdom of God” mean? To understanding this passage we need to first address both the “kingdom” and the ability to “see” the kingdom aspect of this passage. The terms “Kingdom of God” (found 70 times) and “Kingdom of Heaven” (found 33 times) are used interchangeably and both terminologies are only contained in the New Testament portion of the Bible (Mark 1:15, Luke 21:31, Matt. 3:2, 4:17, 10:7). This also let’s us know that the Old Testament saints had no prior knowledge of ever inheriting this kingdom of God or any expectation of a resurrection that would be made available through Christ unto eternal life (Colossians 1:26-27). 1. In one statement (Luke 17:20-21 – “the kingdom of God is within you.” ), Jesus was declaring a spiritual truth that Israel did not see. He clearly was not declaring that a physical kingdom, with its Capital City (Jerusalem) on this Earth (Jeremiah 23:5, Psalms 48:2, Rev 21:2, 10), would be within the physical body of every believer. 2. In several other passages (in reference to Luke 9:27) we are given clear indications that the kingdom of God (at this time) is a place outside the body of man and up in heaven (Heb 12:22-24, Rev 3:12, 12:10, 21:2, 21:10) waiting to come down. There are also two other factors to consider on this matter concerning “seeing” the kingdom of God. 1. One factor to consider is the documented experience of the apostle John. John had a vision (or revelation – the ability to view or perceive something) of things to come (Rev 1:1-3), one of which clearly appears to indicate he “saw” (Rev 1:1, “shew unto his servants“) the kingdom of our God (Rev 12:10) while he was yet alive in exile on the isle of Patmos (Rev 1:9). a. God’s Kingdom is not part of nor within this “sinful” earth realm (not of this world) but away in a place called heaven. 2. However, Jesus’ words were not necessarily concerning those who would attain the Kingdom of God, but more likely it was meant to be a warning to some present who would not attain the Kingdom of God. In other words, there were some who were standing there (in attendance) who took no heed to do what Jesus had taught and it is those who will see him at his second coming after they are raised, but will be condemned. Up to that point, none of them (nor you and I) will not have “tasted” true death, because although their current lives came to an end, they, as Jesus says in other places, will be just “sleeping” awaiting the resurrection (Acts 24:15). The taste of real death is the second death (Rev 20:11-14), and they won’t experience it until they have seen Jesus as judge in his kingdom of God (Acts 17:31, 1 Corinthians 15:24-28 (NLT)). Note: If this were not the case, why does Jesus say they will see him and then “taste death?” Who attains the kingdom of God and then dies? It is only in this setting that this could occur. In Chapter 10, we find Christ sending out seventy more disciples at one time to continue working miracles and to preach (Luke 10:1-3). The mission of the Seventy is clearly distinguished from and contrasted with that of the Twelve by the word ‘others’ in verse 1, which points back to Luke 9:1, yet both were sent to prepare the way for Christ’s personal ministry. “I saw at your command devils immediately depart, as quick as a flash of lightning. I gave you this power – I saw it put forth – and I now give, in addition to this, the power to tread on serpents,” etc. Some argue that by serpents and scorpions our Lord could have been referring to the scribes and Pharisees, whom he calls serpents and a brood of vipers Matthew 23:33. Through the subtlety and venom of the old serpent, the devil, they opposed him and his doctrine; and, by trampling on these they should get a complete victory over such. It seems however, best, in the case of this peculiar promise, to interpret the Lord’s words as referring to spiritual powers of evil, taking the serpent and scorpion as symbols of these. It should be remembered that the subject of conversation between the Master and his servants was the conflict with and victory ever these awful powers hostile to the human race (see Psalms 91:13). Names are written in heaven – The names of citizens of a city or state were accustomed to be written in a book or register, from which they were blotted out when they became unworthy, or forfeited the favor of their country. Compare Psa 69:28; Exo 32:32; Deut 9:14; Rev 3:5. That their “names were written in heaven,” means that they were “citizens” of heaven; that they were friends of God and “approved” by him, and would be permitted to dwell with him. This was of far more value than all “earthly” honor, power, or wealth, and “in” this people should rejoice more than in eminent endowments of influence, learning, talents, or possessions. Did Not Go To Heaven! Did God Lower His Standard of Holiness? One thing is for certain, it wasn’t heaven. It would be total speculation on our part to try and guess what Jesus meant by that phrase because paradise was not called heaven and heaven is not the place Jesus said they would be together. No more is mentioned about thief after he is dead and taken down. We can assume that nothing out of the ordinary occurred with his body because there is no further mention of him. This word paradise (G3857) does not have the same Greek meaning as heaven, (G3772) (the abode of God) although both are thought of as a place of happiness (possibly even a mental state of happiness, as their suffering would soon come to an end, just a thought not a stated position). With that in mind, we can see that Jesus could not have been with the thief in heaven that Friday if Jesus had still not ascended ( 3 days following His death) to the Father on that Sabbath weekend (if paradise is in Heaven). 20 But Christ really has been raised from death—the first one of all those who will be raised. 21 Death comes to people because of what one man did. But now there is resurrection from death because of another man. 22 I mean that in Adam all of us die. And in the same way, in Christ all of us will be made alive again. 23 But everyone will be raised to life in the right order. Christ was first to be raised. Then, when Christ comes again, those who belong to him will be raised to life. The Placement of the Comma Totally Changes The Meaning. In the original Greek text of the New Testament, there was no punctuation, in fact, the oldest copies of both the Greek New Testament and the Hebrew Old Testament are written without punctuations. Sentence punctuation was invented several centuries after the time of Christ. It makes a big difference where the comma is placed. The meaning would completely change if Jesus was saying, “Verily I say unto thee today, thou shalt be with me in paradise” (Luke 23:43). If the comma is placed after the word today, it shows Jesus being emphatic on that day of his crucifixion, saying, today when I am dying on the cross with no apparent hope, I am promising that you will be with me in paradise eventually. However, if the comma is inserted before the word today, Jesus would then be promising that the thief would be with Him that very day in paradise; thus making Jesus a liar and also contradicting John 20:17. There is a story of a wealthy man whose wife sent him a telegram asking if she could buy a very expensive item. He sent the reply, “No, price too high.” Unfortunately, the telegraph operator left the comma out of the message. When the wife received the message, “No price too high,” she happily went and bought the expensive item. This story illustrates the importance of correct punctuation. If the punctuation is off by even one word it can mean something entirely different. As we compare scriptures one with another we will find apparent contradictions, but if we look carefully at the clearest texts and the overwhelming evidence in the scriptures on a certain subject, we will find the truth (see Isaiah 28:10). Often it’s our preconceived ideas that lead us to think a certain verse means a specific thing. We must be careful never to take a verse out of context. The question now is, how can we harmonize this verse with the rest of the Bible? 1 In the beginning was the Word <1>Note: The “Word” G3056 does NOT equate or translate into “Jesus” G2424, these two words are clearly not One and the same. The Word was God, not Jesus, but God’s word/thought/will/plan was given to us or “spoken” through Jesus. John 5:37, 12:49, 14:10, and the Word was with God, and the Word was God. 2 The same was in the beginning with God. 3 All things were made by him <2> Ref. Verses Where “He” & “Him” Should Be Referred To As “It”; and without him was not any thing made that was made. 4 In him was life; and the life was the light of men. You cannot begin to understand the above passage correctly until you first understand the word flexibility and pronoun structuring of the Greek language. A single Greek word can have multiple meanings and be correctly translated into many different English words. However, choosing the correct or best English word to transliterate into scripture is always the challenge for linguistics and translators. When an incorrect English word choice is applied it presents the incorrect intent (message) of that passage and usually many other scriptures then appear to also contradict or conflict with one another. In this particular passage, we are dealing with the Greek word “logos.” This particular Greek word “Logos” – (G3056) can also be correctly translated as, or interpreted as, being the thought of God (what God was thinking or planning). In the beginning was the plan(thought) of God, and the plan was with God, and the plan was God’s. The same plan was in the beginning with God. All things we’re done according to it, and without it nothing was done, that was done. In this plan was life, and that life was the light to mankind. The same plan was in the beginning with Yahweh. John 1:10 – He was in the world, and the world was made by him,….. This is a passage (John 1:10) many have interpreted incorrectly by asserting that it indicates Jesus as being the creator of the world. First, that is not what it says; and second, the context of this section begins in verse 6 (John 1:6) and it starts by telling us, “There came a man who was sent by God.” This lets us know that in this passage of John 1:10 the “He” and “Him” is in reference to God (John 1:1-5), not Christ. In other words, God is light means that God is the source and measure of all that is true. Another way to put it would be that nothing is truly understood until it is understood in the light of God. What is the main value of light? Negatively, it helps you avoid danger. Positively, it helps you reach what you are after. God was in the world in many ways (Rom 1:19-20), including through His Son Jesus (Acts 2:22), though most of the world did not recognize him. He came unto his own by sending Jesus Christ to them (John 3:34), but even then many did not receive God, in that they rejected His emissary (John 12:49-50). 4. What Does It Mean To Be Born Again? No one has ascended to heaven but He who came down from heaven, that is, the Son of Man who is in heaven. <1>John 3:13 – NIV-Text omits who is in heaven. According to Jesus no man (John 3:13) (or no human) has ever entered into heaven “but he” (except Jesus), the “son of man” (the son of a human). I admit that the grammatical structure of this statement can be understandably confusing. But if you do not keep the proper perspective that there is only one God and that God is NOT a man (human), you can find yourself distorting this passage as indicating that God is somehow also called the Son of Man, which is a terminology never used by any of the prophets, apostles or Jesus to describe God the Father. This title is only given to a man. There are however several undisputed and important facts that can be obtained from this passage. 1. Jesus is clearly and specifically speaking about humans only (no man); identifying which humans, if any, who have (or have not) entered into heaven itself. 2. Jesus clearly and specifically claims himself to be the ONLY man (the only human/the son of man), who has ever “ascended up” to heaven. 3. Jesus also did not refer to himself as being God anywhere in this passage. 1. This is another example where there is variation in some of the “original manuscripts”; some contain this section as worded in bold italic others do not. <2>Remember ONLY the scriptures are recorded as being inspired of GOD, yet we have known variations that exist in some of the original manuscripts. Therefore, we must always be mindful that not every translation will necessarily be the same nor does it mean the translation used is the correct one! 2. Most notably however, in reference to who is in heaven, Jesus did not claim to be God rather he claimed himself to be the “Son of man”, and we know neither Jesus or God told lies about who they were. One was the Father, the other (Jesus) was called the Son. It should be noted that the Scriptures do not record the specific place to which Enoch was taken–only that he was taken. For Elijah, he was taken up to heaven. However, the word heaven is used to refer to different things, namely the sky, the domain of the stars, and the dwelling place of God. It seems that Elijah however arose into the sky. 1. ⇑ John 3:13 – NIV-Text omits who is in heaven. 2. ⇑ Remember ONLY the scriptures are recorded as being inspired of GOD, yet we have known variations that exist in some of the original manuscripts. Therefore, we must always be mindful that not every translation will necessarily be the same nor does it mean the translation used is the correct one! The following passages are similar in that they simply indicate by “whose authority” or “on whose behalf” something is done. 1.) Some interpret these passages of scripture to mean that Almighty God literally sent his Son Jesus, who was up in heaven with God the Father, DOWN FROM HEAVEN into the Earth to take the form of a man. Jesus (God the SON) had TWO natures at the same time; one totally divine (as God the SON) and the other totally human. 2.) Others interpret these passages to mean God Himself literally “CAME DOWN FROM HEAVEN” to earth in the form of a man (as an infant), and in essence while God was here on earth, God “pretended” to be his own Son (Jesus), who was “sent” by God (Himself) while God was in His own personal body of fleshly, named Jesus. The truth is it was common for the Jewish people to say that something “came down from heaven” if God were its source or origin. (Mal. 3:10) When God wanted to tell the people that He would bless them if they gave their tithes, He told them that He would open the windows of “heaven” and pour out a blessing. Of course, everyone understood the idiom being used, and no one believed that God would literally pour things out of heaven. They knew that the phrase meant that God was the origin of the blessings they received. God was and is the origin of Jesus Christ. Christ was God’s plan, and God directly fathered Jesus (Heb 1:5) after He made Jesus in the womb of a woman (Gal 4:4) named Mary. The idiom (from Heaven) is the same when used of Jesus. Jesus is “from God,” “from heaven” or “from above” in the sense that God is his Father and thus his origin. The key to understanding John 6:46 is knowing that the phrase “seen the Father” does not refer to seeing with the eye, but to “knowing the Father.” Jesus knew God because God revealed Himself more clearly to Jesus than to anyone else. Jesus made this clear in other teachings, saying, “For the Father loves the Son and shows him all he does…” (John 5:20 NIV). The usage of “see” as it pertains to knowing is found in many places in the New Testament. For example, Jesus said to Philip, “…Anyone who has seen me has seen the Father…” (John 14:9). Here again the word “see” is used to indicate knowing. Anyone who knew Christ (not just those who “saw” him) would know the Father. In fact, Christ had made that clear two verses earlier when he said to Philip, “If you really knew me, you would know my Father as well. From now on, you do know him and have seen him” (John 14:7). In this verse Jesus says that those who know him have “seen” the Father. One of the verses that uses the word “seen” in the sense of “known” is (John 1:18 GW). The phrase “seen God” is parallel to the phrase “has made Him known,” and both phrases refer to knowing God. No man fully knew God, but Jesus made Him known. Throughout the Old Testament, what people knew about God was very limited. In fact, 2 Corinthians 3:13-16 refers to the fact that even today, the Jews who reject Christ have a veil over their hearts. The full knowledge, the “truth” about God, came through Jesus Christ (John 1:17). He was the one who “saw” (fully understood) God, and then he taught others—which is what John 1:18 says. Before Jesus Christ came, no one really knew God as He truly is, a loving heavenly Father, but Jesus Christ “saw” (knew) God intimately, because the Father revealed Himself clearly to him. This verse (John 6:62) is referring to the resurrection of Christ, not the ascension of Christ up to Heaven. The translators have chosen to translate the Greek word anabaino (G305) as “ascend up” instead of “arise.” As a result many people believed it referred to Christ’s ascension from earth as recorded in Acts 1:9, however Acts 1:9 does not use this word. Jesus was speaking about being the bread from heaven and giving life via his resurrection. Jesus was teaching the Jews of his yet FUTURE death and resurrection. This would show that he had conquered death and was ALIVE forever more and that he was indeed the SON of Almighty God. Remember many Jewish leaders did not believe in the resurrection at that time (Mat 22:23). In addition, Jesus said “I will raise him up [any believer] at the last day” (John 6:39, 40, 44). John 14:7 – …from henceforth ye know him, and have seen him. Was Jesus Proclaiming Himself To Be God? Many of us who carry the banner of being Apostolic/Oneness have often used John 14:7-9 to support the teaching that the man Jesus Christ was actually proclaiming himself to be God the Father as well as being the Son of God. Having been brought up in an Apostolic home I am familiar with this teaching. I consider myself Apostolic, in that I follow and believe the teachings of Jesus Christ and the doctrine taught by his disciples the Apostles. However, in my reading and study of the scriptures, this is not what John 14:7 (nor John 14:9) says or implies. Let’s take a careful look at each line. There are three statements made within this first passage alone, each one makes it abundantly clear that Jesus is referencing someone else. First, Jesus’ reference to “my Father” is in reference to someone other than himself. Many ignore the significance of this passage also. Philip certainly didn’t have the impression that Jesus was proclaiming himself to be God the Father because he asked Jesus to show Him the Father. The request was actually a challenge to Jesus to produce some visible evidence (shew us that it sufficeth us) to show them God. Jesus was not teaching in parables in his response to Philip. If Jesus wanted his disciples to believe he was God the Father, He could have stated, “I am the Father, I am standing right here before you.” But the fact is, Jesus never once claimed to be God during His lifetime (on Earth or in Heaven). Jesus is not a liar, pretender or a fake. Jesus never said he was God, he never pretended to be God and he never tried to make anyone believe it either. So when we look at the teachings of the men Jesus personally selected and taught (the Apostles) and what they taught others it becomes impossible to deny that what many churches are teaching today is not the same. These men actually knew Jesus personally, they followed him throughout his ministry, they ate with him, watched his life and his ministry; I believe they were more of an authority on the teachings of Jesus than any of us especially when they received it directly from Jesus Christ. None of these men, those that were closest to Jesus, believed, preached or taught anyone that Jesus was God the Father. These men are the men Jesus trusted to carry his gospel into the entire world, in the New Testament writings these men, especially Paul, clearly delineate between God and Jesus. They are not confused, they are not contradicting the teachings of Jesus Christ, they are carrying the message they were given without adding to or taking away from the truth they were handed. Surprisingly, people even manage to ignore the proceeding passage that follows (John 14:7-9) and clarifies Jesus statement. Most importantly, it is this statement, in verse 10, from Jesus himself, “I speak not of myself,” that makes clear that Jesus was not speaking about himself as being God the Father, literally, but that He was being moved by God (God’s Spirit) and therefore could speak with such authority. Note: God gave Jesus the commands (instructions) as what He should say and do. (See also: Frequently Asked Questions About Creation ). Why would you have to believe that Jesus is God in order to obtain God’s Plan of Salvation? 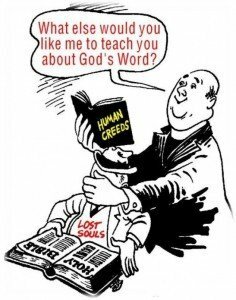 Why should anyone be required to believe Jesus is God (or teach others the same) in order for man to obtain God’s Plan of Salvation when the Word of God sets forth no such terms or conditions as requirements? Why should we teach others to believe some non-biblical man-made criteria (Jesus is God the Father) then present it through our preaching as if it is true and necessary for God’s plan of Salvation? John 14:10-11 Believest thou not that I am in the Father, and the Father in me? Does John (14:10-11) Indicate Incarnation? (John 14:10-11) does NOT indicate incarnation but unification. This passage denotes two spirits (“I am in the Father” or “the Father in Me”) agreeing as one (on one accord). (2 Corinthians 5:17) – Therefore if any man be “in” Christ, he is a new creature: old things are passed away; behold, all things are become new. Yet we all know that this verse is not literal; man is not literally inside another individual, this is figuratively spoken. Man is also not a new physical being but a changed spiritual being. Man’s old way of thinking, living and behaving die (but not literally, they change) and his thoughts, actions, and life become new (different). When we are doing God’s will, following his leading we are “one” with God. Thus we, I and my father (spiritually), are indeed one (unified). We are also one with Christ (you and I). Note: The Bible is full of figurtive speech, just as in contrast with the Biblical phrase to be “cut off ” (found 194 times in KJV) which does not always indicate the literal “physical” act of cutting (Numbers 19:13; Proverbs 2:22; Jeremiah 7:28), but that of a separation (as in discontinuing a relationship, fellowship, etc..). Q. If Jesus did not exists as God, or as God the Son, how do we explain John 17:5? This is a good question and there is a good reason why many questions exist surrounding this passage in John. Most Trinitarians have transliterated the sentence structure of John 17:5 as if Jesus existed with God literally “before the world was”, which is not true. There are Five Points that are vitally important in understanding this particular passage (John 17:5). Point #2 : God Cannot Lie! There are two important rules when dealing with God: Rule Number One, God cannot lie. Rule Number Two: If you think He did, refer to rule number one. Isaiah 45:5-6 – I am the Lord, and there is none else, there is no God beside me: I girded thee, though thou hast not known me: 6 That they may know from the rising of the sun, and from the west, that there is none beside me. I am the Lord, and there is none else. One of the attributes that distinguishes God as God is the fact that he alone is the creator of all things. Not only did God alone create all things; God alone was not created. ♦ Jesus never, not once, claimed to have created anyone or anything. This is an undisputed fact! We believe that the original manuscripts were the dictates of “one directing Mind” (God), (2 Peter 1:21). Many incorrectly teach that John 17:5 is confirmation that Jesus existed as a self-conscious person prior to the creation of the world. If you do chose to accept the KJ translated version, it must be with the understanding that your interpretation MUST be in line with what GOD SAID and remain in harmony with any companion scriptures on the subject matter at hand. ♦ Similarly, Paul speaks about something given to us before the creation of the world. However that reality only was manifested in our time and space at the appearing of Jesus our Savior. 2 Tim 1:9 Who hath saved us, and called us with an holy calling, not according to our works, but according to his own purpose and grace, which was given us in Christ Jesus before the world began. ♦ Similarly, Jesus was the human Lamb slain from the foundation of the world (Rev 13:8) and this human Lamb was foreknown before the foundation of the world (1 Peter 1:20). Although he himself was not yet glorified, that glory was given by the Father to his human son before the foundation of the world. God the Father glorified Jesus when He raised him from the dead. Jesus is saying that his glorification was a done deal before creation because God the Father, in His love for his human son Jesus, had purposed it to occur. The concept of being alongside the Father is mentioned twice in this verse. The word ειναι (G1511) is translated as “was” instead of “to be” and is taken to describe the state of the world which the grammar does not require. This verb is an infinitive which means “to be.” In most bibles (which are predominatly Trinitarian structured translations) the words παρα σοι (with (G3844) thee) are essentially divorced from the word ειναι (to be) as if the latter has nothing to do with the former. This makes it appear that Jesus was having glory alongside the Father before the world was. To the contrary, Jesus is saying that he had something before the world and that something was to be glorified alongside the Father in the future. In other words, God had predestined this to occur. You before the world to come. NOTE: The same concept can also be found in Ephesians 1:4. God also chose Christians before the foundation of the world TO BE (ειναι – the same infinitive) holy and blameless. The phrase “My Lord and my God” is one many misinterpret to be indicating something that it isn’t. Theologians have said, The Apostle Thomas calls Jesus God: “And Thomas answered and said unto him, My Lord and my God” – John 20:28. When we intentionally isolate this one verse from its entire passage of scriptures (John chapter 20) , it’s done so as to present it incorrectly or out of context. We can only speculate as to why Thomas said what he said, but being dubbed “doubting” Thomas it is understandable that his statement was made in a moment of shock/disbelief (Jesus appearing out of nowhere), similar to someone saying “Oh my God” where did you come from? (even though you are not God). Nonetheless, even those who do attempt to present doubting Thomas’ words out of context (My Lord and my God) they cannot honestly claim that the apostle John believed Jesus was God. When you continue reading the rest of his passage (John 20:30-31) it is clear from the authors’ writing (the Apostle John who was also present when this all took place), “these are written, that ye might believe that Jesus is the Christ, the Son of God”, it was NOT written so you would believe Jesus was God. John 20:27-31 –Then saith he to Thomas, Reach hither thy finger, and behold my hands; and reach hither thy hand, and thrust it into my side: and be not faithless, but believing. 28And Thomas answered and said unto him, My Lord and my God. 29Jesus saith unto him, Thomas, because thou hast seen me, thou hast believed: blessed are they that have not seen, and yet have believed. 30And many other signs truly did Jesus in the presence of his disciples, which are not written in this book: 31 But these are written, that ye might believe that Jesus is the Christ, the Son of God; and that believing ye might have life through his name. Many of us have been taught that this passage of scripture in particular (Acts 9:4-5) is evidence that the Lord “God” spoke his name to Paul. First, nowhere does this passage say anything about God. This is an incorrect, yet understandable, conclusion (actually it is an assumption) that is often drawn from several factors. In order to correctly understand this passage, we need to first understand how the Bible is written. (Ref: Biblical Metaphors & Figures Of Speech) In particular, you need to understand what a hyperbole is. Hyperbole – an exaggeration of the size, power, meaning, and so on, of an object or phenomenon in order to emphasize that. A hyperbole (which is an “exaggeration”, when more is said than is literally meant to make a point) is another common figure of speech form used in the Bible. We who use the English language are quite familiar with the use of hyperbole, even though we may not be as familiar with the term itself. When a teenager explains to her parent that “everybody” is going to be at the party, does she mean that literally, the world’s population of 6.6 billion people will be there? Of course, she does not. She is intentionally exaggerating to make a point. When a teacher explains to his class that “everybody” knows who the first president of the United States was, does the teacher believe all toddlers can correctly answer the question? No. Once again, the teacher is simply using a well-understood figure of speech to convey a point. To illustrate further, consider Mark 1:4-5: “John came baptizing in the wilderness and preaching a baptism of repentance for the remission of sins. Then all the land of Judea and those from Jerusalem went out to him and were all baptized by him in the Jordan River, confessing their sins” (emp. added). Taken literally, these verses would mean that John baptized every single person (man, woman, and child) in all of Judea and Jerusalem. But these verses are not to be taken literally. They are utilizing hyperbole, in which intentional “exaggeration” is employed to explain that John’s baptism was extremely popular. The very first observation that many usually overlook when they cite this passage is the phrase “have sinned”. By itself this word biblically indicates an “act, thought, or way of behaving that has been committed against the law of God”. To say that someone has “sinned” is to say that person already committed an “act, thought, or way of behaving that went against the law of God”. To put it simply it is something in your actions (behavior) that dictates if a sin has been committed. Wow! Let’s prove this truth. A few verses later in Romans 5:19 Paul now states “For as by one man’s disobedience many (not all) were made sinners”. Here Paul says “many” were made sinners, in contrast to “all”, so how do we determine Paul’s intent? If you just indiscriminately claim that this statement applies to “everyone” (all of mankind) in the literal sense it must also apply to Jesus because Jesus was also a “man”, declared so by his own indisputable testimony (John 8:40), (Ref: John 7:42; Romans 1:3-4; 2 Timothy 2:8) (See also: Christ and His Humanity). Holding that position would clearly contradict other scriptures that Jesus did not commit sin (1 Peter 2:22; 1 John 3:5). Now we have this seemingly potential dilemma as to the grammatical correctness or intent of the passage. (2 Corinthians 5:10) – “Each one will be judged according to what he has done in the body, good or bad.” If this verse is true then this means no one will be condemned for Adam’s sin, except Adam! We, therefore, need to explore how these verses best harmonize without being contradictory. Because the bible is written for those who have a level of intelligence or comprehension, when an infant dies each one will be judged according to what they have done ( 2 Corinthians 5:10) so we can concede that an infant would have done the least wrong or sin in comparison to any adult who dies regardless if the adult became a Christian. So, today we have both death and a sinful nature that was inherited from this one act of disobedience and with age, time and study we learn to discern both good and evil. The question many have regards babies and are babies born with sin. (Romans 5:12) states “all have sinned.” If All meant ALL (as to include infants) then babies are born with sin. However, if true that would also mean all of mankind is born with sin, even Jesus Christ would not be exempt, he himself “born” (Matthew 1:16, 2:1; Luke 1:35, 2:11), a “human child” of Mary (Matthew 1:16) and seed of David (John 7:42; Romans 1:3; 2 Timothy 2:8). Yet, the Bible tells us that this man (John 8:40) was without sin (1 Peter 2:22). Is sin actually inherent at the first breath an infant takes into their lungs? Or, does choice play a part; being a point of entry into each life? Until Adam exercised his choice/free will to disobey God’s commandment there was no sin in his life. Once he disobeyed and his eyes were opened there were other things he came to understand were not as they should be and had to be changed. In Adam’s life, sin was nonexistent without that choice. Once that choice was made, then discernment and accountability came into play. When an infant is born they lack the ability to choose anything for themselves, their entire existence depends on the care and nurture of others. It is not until they have the ability to choose to disobey that sin enters the picture. Even then, until they have the ability to discern right from wrong can full accountability come into play? Based on the word of God there are clearly different degrees of understanding and accountability. It is impossible to disobey without a choice. Disobedience comes with a price, but it is impossible to disobey if you have no knowledge that what you are doing is wrong. The basic knowledge of right from wrong starts being learned at a very young age. How many people reading this know this scenario? “Don’t touch that, it is hot.” followed by a curious child touching the object and learning what both “don’t touch” and “hot” mean. At this point, did the child sin? Until after the lesson of what “don’t touch” and “hot” means the child does not comprehend that touching the object is wrong. It is with this repetitive lesson. “Don’t touch that…” that the child begins to understand this is an order and they are not supposed to disobey. When the child turns to the parent with a knowing look and an ornery grin and touches the object anyway, they have made a choice and they have disobeyed, they are then accountable and pay a consequence with a swat on a diaper-padded bottom, or a moment in time out. Was punishment meant to hurt the child or teach them the serious nature of the infraction? Children are taught in degrees. Choice and disobedience also present itself in degrees. There are often questions concerning this passage of scripture (Romans 8:9) and the wording (as used by KJV and some others) concerning the “Spirit of God” and the “Spirit of Christ“. If we are not careful, and omit reading the entire chapter, it is possible to misinterpret this passage as being in reference to either two members of a Trinity (Trinitarians) or Christ as being the Spirit of Life itself, which is the Spirit (of God). Romans 8:1-11 is speaking about receiving Life from the Spirit, the “Spirit of Life.” It is this life giving Spirit, which comes from God who quickens (G2227) a mortal body (makes alive) and it was this same “Spirit” (of God) that raised Christ up from the dead (Rom 8:11). Rom 8:9 (KJV) But ye are not in the flesh, but in the Spirit, if so be that the Spirit of God dwell in you. Now if any man have not the Spirit of Christ,(does not have this Spirit as the Messiah) he is none of his. This is important to understand for when Romans 8:10 speaks of Christ, “if Christ be in you“, it also speaks of the Spirit, “the Spirit is Life“, however it is not well worded and may be misinterpreted if you are not well versed in the scripture. The Spirit of Life is in reference to God, it is not in reference to Christ. Rom 8:10 (KJV) And if Christ be in you, the body is dead because of sin; but the Spirit is life because of righteousness. Note: “if Christ be in you“– Is similar to passages like; “Those who have put on Christ” (Rom 13:14, Gal 3:27) or (Eph 4:24, Col 3:10-12) “put on the new man”, etc. – it is speaking of reflecting the will, character, conduct, a life that is patterned of Christ, which is of the righteousness of God himself (Rom 3:22). Once Christ has become part of our life (because of faithful obedience -Rom 5:19, John 8:29, 12:49-50, 14:31, Acts 5:31-32) we will receive this same salvation (1Peter 1:3-5). A resurrection as Christ received, (verse 5 “Who are kept by the power of God through faith unto salvation ready to be revealed in the last time“), which Paul points out clearly in verse 11 below. Rom 8:11 But if the Spirit of him (God) that raised up Jesus from the dead dwell in you, he that raised up Christ from the dead shall also quicken your mortal bodies by his Spirit (God which is The Spirit of Life) that dwelleth in you. 2. those who read this phrase as a eulogy referring to God the Father “God, who is over all, be blessed forever! Amen.” The full version (RSV) below. After doing some extensive research in review and comparing other closely worded verses (Romans 1:25; 2 Corinthians 11:31; 1 Timothy 6:13-16) I am in agreement with the second view, that the evidence supports those that view this as a eulogy to God the Father. It does not say “Paul recognized the pre-existence of Christ as God the Father himself”. Roman 9:5 does not prove that Paul ever thought of Christ as God, to the contrary God is spoken of by the Apostle Paul not only as the Father but also the God of our Lord Jesus Christ (2 Corinthians 11:31; Ephesians 1:3, 17; 3:14; 1 Peter 1:3; 2 John 1:3). IN THE BIBLE : The word “manifest” is found used in various forms. God is called God because he has inherent abilities that nothing or no one (humans) possess. God appearing as a human (or dwelling within another human) is completely different than someone who is “totally human” (according to their definition and their attributes – See: Incarnation vs Indwelling). Humans can not “at will” change our normal physical state of existence and “appear as” something else other than what we are. The best we can do is pretend to be something else. Although an incarnation is a type of manifestation, there is however a significant difference that exist between the two that must be understood. Many things can be considered the manifestation of something or someone. We are the manifestation of Christ, who was the manifestation of God. We who follow Christ are likewise the manifestation of God yet we are not the complete “physical substance” of God literally but rather God is made known (manifest) through us. We have plenty examples showing the variety of ways the Bible uses this word manifest (Romans 1:19; 1 Corinthians 15:27; Galatians 5:19; 1 Peter 1:20-21; 1 John 3:9-10). (2 Corinthians 4:10-14) “Always bearing about in the body the dying of the Lord Jesus, that the life also of Jesus might be made manifest [but not in person literally] in our body. 11 For we which live are always delivered unto death for Jesus’ sake, that the life also of Jesus might be made manifest [but not in person literally] in our mortal flesh. 12 So then death worketh in us, but life in you. 13 We having the same spirit of faith, according as it is written, I believed, and therefore have I spoken; we also believe, and therefore speak; 14 Knowing that he [God] which raised up the Lord Jesus shall raise up us also by Jesus, and shall present us with you. However if we say God actually incarnated himself and if it were true then by definition, God would not cease being God. The only change would be that of his appearance, God would had became material (visible). God became a visible God, a God that went around literally talking and walking with men in his fleshly state while he retained all of his other Godly attributes, he still had, “all knowledge” and “all power” and therefore by definition he would not be “totally” human. The church is now forced to make the claim that God was either “playing a role” as Son or “acting as” a man (neither of which is what the Bible says) or we make Jesus to be a liar. (1 Timothy 3:16) – And without controversy great is the mystery of godliness: God was manifest (God was revealed, Not Incarnated ) in the flesh, justified in the Spirit, seen of angels, preached unto the Gentiles, believed on in the world, received up into glory. God was manifest in the flesh, not incarnated in the flesh, in other words God made himself evident (his will or Spirit) through the man Jesus Christ. Jesus became a conduit to God through obedience which allowed Jesus to work in direct alignment with God’s will, in his power and with his authority. These were God given attributes that Jesus availed himself to through obedience. God did not become Jesus rather he worked through Jesus (Acts 2:22); Jesus did not become God but allowed God’s Spirit to make God’s will, his word and his plan, flow through his humanity (“the Father that dwelleth in me” – John 14:10) translating the will of God (a Spirit) into the acts/demonstration of Jesus (a man). Because of Jesus Christ’s obedience God’s purpose was exemplified and demonstrated. God’s purpose was fulfilled, man was redeemed. God gave specific criteria for the sacrifice that would satisfy the redemption of man, the humanity of, not the deity of Jesus Christ, satisfied that criteria. If you dilute the humanity of Jesus Christ and his overcoming of his human nature by submitting his flesh to an Almighty God, his example of being a human man with the same challenges and temptations that we face, we lose the significance of the sacrifice. It becomes God circumventing the natural order he created and the criteria he ordained and applying a human tendency of the end justifies the means. If we take away the humanity of Christ, we dilute the sacrifice. Jesus becomes a Man/God that never overcame the same temptations we face as human beings because he would have had the advantage of being God and perfect without ever having had the free will choice to submit his flesh to the cross. God did not choose to be sinless, he was never anything but sinless and cannot sin so that is not unusual, but for a man (Jesus) to choose to be sinless in obedience to his father, unlike Adam who did disobey, that is a phenomenal feat and is what gives a sinful mankind hope. Note: (Having the “ability” to commit sin (or disobey God) is different than putting that ability you have into practice). If Jesus was capable (had the ability) of committing sin he would be human (or not “totally” God), because all “real” humans are capable of committing a sin against (or disobeying) God. This passage is even more confusing because many of us had been taught that “all men” were somehow born into this world with sin in their bodies from birth. We were taught that we all are “born sinners” (which would also include the many infants who died at birth or premature, or accidentally during infancy, mentally disabled, all the many non-English speaking natives, etc..). Second, another passage frequently referenced is (Rom 5:12) which says all have sinned but it does NOT say all men are BORN sinners! The Bible doesn’t mention babies needing to be baptized, repent of their sins, confess Jesus or even worship God during this stage of their growth and development. If Jesus was indeed truly 100% human (not part human) and the true seed of David as the Bible declares then his “birth” experience is the same as any other infant who enters into the world by birth of a woman. Jesus was sinless because he committed no sin, it had nothing to do with the manner of His birth into the world. Note: There are two infants whom the Bible clearly reflect this to be the case, the first was John (Luke 1:13-15). And finally, we have the record of this child Jesus (Yahshua), the seed of David, the son of Mary (Luke 1:31-32, 35, 1 Peter 2:21-22). This writing in 1 Peter indicates that we are able to live a sin free life patterned after Christ. It doesn’t say Jesus was born without sin, or that Jesus could not sin, but who DID NO sin!!! How did Jesus accomplish this feat, he “.. committed himself to him (God) that judgeth righteously:” and because God was with Christ (Acts 10:38, 1 Peter 2:23), and if we have God in our lives and are obedient to His will (Acts 5:32, 1 Thessalonians 4:8) we too will be sinless. God had “purposed” (made G4160) Christ to be a sin offering for us (1 John 4:10-14, 1 Peter 1:20, Rev 13:8). Naturally, any sacrificial offering presented to God had to be the “best” offering man had to offer God for any atonement. Christ took it upon himself to fulfill God’s plan (Luke 22:42, John 8:29), God did not force Christ to obey Him (John 8:26, 28). Note: If Christ actually existed up in Heaven, with the angels (as a living being, or as God) prior his human birth, Jesus would be something other than a real human (he would be an alien). Furthermore, any human offspring could not possibly exist prior to the existence of its parents (King David, Mary or God, the Father of Jesus) existed. The only way you can PRE-exist, your actual existence is in the thought of someone else (God)! 21 For Yahweh made Him, Who knew no sin, to be a sin offering for us, that we might become the righteousness of Yahweh, through Him. Comment: [Again, God the Father is the God of Jesus Christ; that is clear; yet Jesus is also called “Lord,” which sometimes can also be a title of God. and set him at his own right hand in the heavenly places; which is expressive of the great honor conferred upon Christ, such as never was given to any of the angels; it shows that he has done his work on earth with acceptance and therefore is set down at his Father’s right hand, where he enjoys rest and ease from his labors, and is out of the reach of every enemy; will never die again, but live forever, to intercede for his people, to assist and protect them, and bring them where he is; and in whom, as their head and representative, they are already set down in the same heavenly places. The phrase “image of the invisible God” is always in reference to him who is “both” the God and Father of Jesus Christ. Many point to Colossians 1:15 (“Who is the image of the invisible God”) in support of this incarnation claim. Now, if something is truly invisible, the only way you can be the image of anything invisible is figuratively speaking, by reflecting its character, not its physical make-up. If one thing is the “image” of another thing, then the “image” and the “original” are not the same things!!! When you look at someone standing in front of a mirror you see a reflection of their image. The Father is called “God” in many verses, and that is why there is no verse that calls the Father the image of God. Words in the Bible must be read and understood in their common or ordinary meaning unless good reason can be given to alter that meaning. In this case, the common meaning of “image” is “likeness” or “resemblance, representative” (Ref: G1504) and it is used that way every time in the New Testament. In the Bible, the word “firstborn” is always used as either being the firstborn offspring of a father (as in Genesis 25:13) or as part of a group being spoken of (as in Exodus 11:5). 2) A “creature” reflects a type of species, and all creatures (species) were created by God (Yahweh) (Isaiah 44:24). Jesus came into existence through the creative act of God (1 Ch 17:11-13; Acts 13:33; Heb 1:5), yet Jesus was certainly not the first living creature God created. As it pertains to his “birth” we know that this passage is also not speaking of Jesus’ first birth, his human birth at Bethlehem. It is speaking after He was physically born of the Virgin Mary—because many were born (of human birth) before Jesus. In Luke 3:38, we find a lineage of Christ that traces him back to Adam. Here we have it stated that Adam was the Son of God. Knowing that Adam was the first created of the physical race. Adam was considered a son of God because he had no natural father, Jesus is likewise considered the Son of God, for he also had no natural father. We read in Psalms 89:27 that GOD would make him (Jesus) his firstborn. The key word in this reference is the use of the word “make”, that GOD would make him his firstborn. By his natural birth, Jesus was not the “firstborn” of all of God’s creatures. This is why the dialogue with Nicodemus was so important (John 3:3-6). We must be born again in the same manner as Christ. When we are given this new life, it is the same new birth/born again experience Jesus speaks of. Since Jesus is the firstborn of many brethren, these many brethren will be born having the same kind of birth experience as Christ. The Bible says we will one day be like Christ (not like God) when he appears (1 John 3:2, Col 3:4, Heb 9:28, Php 3:21) – and joint heirs with Christ (Romans 8:17). In order to be like Christ, we must all be born again, as was Christ. Our flesh body must first somehow DIE or, as we know it, cease from existing as a blood functioning/breathing human being. Only then could a man be literally born again (given new life)! This Experience is obtained at the Resurrection, Jesus obtained it and so shall we! Yes, Jesus was also born again (given new life) — but this time born of God by the resurrection from the dead. Yes, some will still be alive when Christ returns, during what we call the Rapture, and they too will be caught up to meet Christ in the air (1Th 4:16-17). Either way, the old body of flesh will die (Jas 2:26) and will be changed or given new bodies (1 Cor 15:52-53). We do NOT consider the various translations as the Word of God (just the original manuscripts), but that these translations from the original manuscripts have been born out of the need for the Word of God to be transmitted to men of different races and languages. 16 Because (hoti- G3754) before (en- G1722) Him all things were created that are in heaven, and that are in earth, visible and invisible, whether thrones, or rulerships, or principalities, or powers; all things were created on account of (because of) (dia- G1223) Him, and for Him. This version is undisputedly contradictory to the word of God (Gen 1:27, Isaiah 44:24; Nehemiah 9:6) and harmony of the scriptures. Jesus NEVER claimed to have created ANYTHING!! It is “modern man,” (not the original writers), who created and printed this very serious mistransliteration and continue to discriminate this falsehood. And He (Jesus) is above……And all the things have been placed together under him. The phrase in verse 17 that “he is before all things” has been used to try to prove that Jesus existed before everything else. However, the word “before” (G4253 – pro) can refer to time, place or position (i.e., superiority). The point of the passage here is to show that Christ is above or “superior to” all things, and the following passages reflect his superiority (words such as the fulness, the head, the beginning, before). This passage aligns with what vs 18 signifies, Jesus is indeed (above us, superior to, the head) of the church. (Verse 20) And, having made peace through the blood of his cross, by him (Jesus) to reconcile all things unto himself; by him (Jesus), I say, whether they be things in earth, or things in heaven. And, through Jesus, to reconcile all things to Himself God, having made peace through his blood on the cross, whether they be things in earth or things in heaven. IN THE BIBLE: The word “manifest” is found used in various forms. Although an incarnation is a type of manifestation, there is, however, a significant difference that exists between the two that must be understood. Many things can be considered the manifestation of something or someone. We are the manifestation of Christ, who was the manifestation of God. We who follow Christ are likewise the manifestation of God yet we are not the complete “physical substance” of God literally but rather God is made known (manifest) through us. We have plenty examples showing the variety of ways the Bible uses this word manifest (Romans 1:19; 1 Corinthians 15:27; Galatians 5:19; 1 Peter 1:20-21; 1 John 3:9-10). However if we say God actually incarnated himself and if it were true then by definition, God would not cease being God. The only change would be that of his appearance, God would have become material (visible). God became a visible God, a God that went around literally talking and walking with men in his fleshly state while he retained all of his other Godly attributes, he still had, “all knowledge” and “all power” and therefore by definition he would not be “totally” human. The church is now forced to make the claim that God was either “playing a role” as Son or “acting as” a man (neither of which is what the Bible says) or we make Jesus be a liar. God was manifest in the flesh, not incarnated in the flesh, in other words, God made himself evident (his will or Spirit) through the man Jesus Christ. Jesus became a conduit to God through obedience which allowed Jesus to work in direct alignment with God’s will, in his power and with his authority. These were God-given attributes that Jesus availed himself to through obedience. God did not become Jesus rather he worked through Jesus (Acts 2:22); Jesus did not become God but allowed God’s Spirit to make God’s will, his word, and his plan, flow through his humanity (“the Father that dwelleth in me” – John 14:10) translating the will of God (a Spirit) into the acts/demonstration of Jesus (a man). Because of Jesus Christ’s obedience, God’s purpose was exemplified and demonstrated. God’s purpose was fulfilled, man was redeemed. God gave specific criteria for the sacrifice that would satisfy the redemption of man, the humanity of, not the deity of Jesus Christ, satisfied that criteria. If you dilute the humanity of Jesus Christ and the overcoming of his human nature by submitting his flesh to an Almighty God, his example of being a human man with the same challenges and temptations that we face, we lose the significance of the sacrifice. It becomes God circumventing the natural order he created and the criteria he ordained and applying a human tendency of the end justifies the means. If we take away the humanity of Christ, we dilute the sacrifice. Jesus becomes a Man/God that never overcame the same temptations we face as human beings because he would have had the advantage of being God and perfect without ever having had the free will choice to submit his flesh to the cross. That thou keep this commandment without spot, unrebukeable, until the appearing of our Lord Jesus Christ: 15 Which in his times he shall shew, who is the blessed and only Potentate, the King of kings, and Lord of lords; 16 Who only hath immortality, dwelling in the light which no man can approach unto; whom no man hath seen, nor can see: to whom be honour and power everlasting. Amen. (16) who alone is immortal and who lives in unapproachable light, whom no one has seen or can see. To him be honor and might forever. Amen. (14) Do what you were commanded to do without fault or blame until the time when our Lord Jesus Christ comes again. (15) God will make that happen at the right time. God is the blessed and only Ruler. He is the King of all kings and the Lord of all lords. (16) God is the only one who never dies. He lives in light so bright that people cannot go near it. No one has ever seen him; no one is able to see him. All honor and power belong to him forever. Amen. Scholars debate what the exact translation of this passage should be. The word “great” is clearly identified as belonging to “God” but there are those who suggest that Jesus is the great God being referred to in this passage. In the writings of Paul we know that Paul is persistent about this one fact, that “there is but one God, the Father and he consistently distinguishes the identity of “God” from that of “Jesus” as being two separate and distinct personages or beings. Because the Greek structure and style is complex, and in order to help us obtain a better understanding of verse 13, let us begin two verses before. Note: We all know that “grace” did not make some “physical” appearance, but rather the knowledge given us through Christ, who spoke concerning the grace of God and the manifestation of His glory. The significance of the “appearing” in verse 13 was in reference to the “glory” that will be displayed. Not the display of God himself but “the glory of both”, the glory of God and the glory of our Saviour Jesus Christ will have been displayed. For whosoever shall be ashamed of me and of my words, of him shall the Son of man be ashamed, when he shall come in his own glory, and in his Father’s, and of the holy angels (Luke 9:26). When Christ returns it will be with his glory and with the glory of his Father (God) and with the glory of the Holy angels. Once we understand Luke 9:26 (….when he returns it will be with his glory as well as with the glory of the Father.) the meaning of the text becomes clearer and fits in perfect harmony with the rest of Scripture. The Image of The “Invisible” God, Displays God’s Character Not His Physical Appearance! There are those who say the wording in this passage “the express image of his person” proves Jesus is God. They say “express” means exact copy or precise. 1. Jesus would still be a copy not the original. 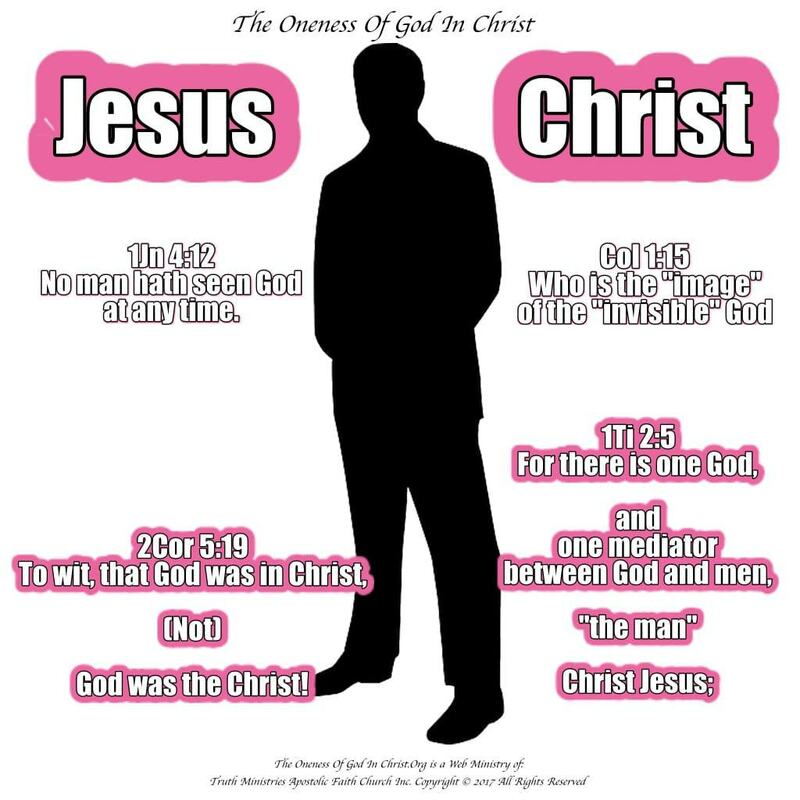 Even if we take this statement “express image” as meaning an “exact copy” in the literal sense it invalidates the claim that Jesus was God because by its very definition Jesus would be nothing more than an “exact copy of” who God is. Even if Jesus looked like God and God actually looked like the man, Jesus would still be a copy not the original. Furthermore, when this passage is read in the correct context from which it was taken (Heb 1:1-2) Paul tells us that God delivered his messages, at that time, through His Son [Jesus] therefore Jesus was indeed in an official representation capacity speaking for God. Paul clearly was not saying that God himself came directly to us in person (Heb 1:1-7). The Greek Word “Dia” (G1223) found in Heb 1:2, which is a mistransliteration concerning the creation, should say (for) whom (not by whom) also he [God] made the worlds; See also: (2. Who is the Creator, God or Jesus?) to understand and verify the mistranslation. Most scriptures reflect Jesus as standing or sitting down at the right hand of God. It is irrelevant whether the “right hand” of God is stated as being figurative or literal, either way, it denotes Jesus at a position to someone other than himself. The point is that these men of God were somehow able to “visibly distinguish” the spiritual personage of Jesus from that of God. They were somehow able to identify Jesus as the one standing on the right hand of God himself. This could not have been accomplished if Jesus and God were actually identical (the express image) spiritual personages in appearance. Jesus said All power was given him, The Son can do nothing of himself and that his Father was greater than he was (Matthew 28:18, John 5:19, 10:29 and 14:28). This cannot be if Jesus is literally the manifest Eternal Spirit of God the Father himself speaking here. Either he was telling the truth or he was lying about his power and its source if they were literally one and the same. No man has seen God at any time or heard his voice, both occurred with Jesus. It is obvious from Scripture that Jesus did not know everything, for he grew in wisdom (Luke 2:52). Jesus said that ONLY His Father knew the day of the second coming, not the Son (Matthew 24:36, Mark 13:32). Again, either he was telling the truth or he was lying about his knowledge if as we say, they are one and the same. 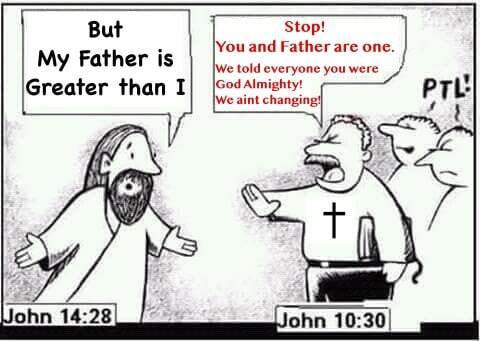 If Jesus was telling the truth, clearly they are not the same. If the above incarnation definition is correct, then by our current definition we make God out to be either a deceiver when Jesus told his disciples’ many mansions were “in my Father’s house” instead of his house. Or in many other verses a liar when Jesus claims to be someone else (the Son of God), instead of who he truly was, God himself. ♦ We also cite (Colossians 1:15) “Who is the image of the invisible God” in support of our incarnation claim. If something is truly invisible, the only way you can be the image of anything invisible is figuratively speaking, by reflecting its character, not its physical make-up. ♦ If one thing is the “image” of another thing, then the “image” and the “original” are not the same things. When you look at someone standing in front of a mirror you see a reflection of their image. The Father is called “God” in many verses, and that is why there is no verse that calls the Father the image of God. Words in the Bible must be read and understood in their common or ordinary meaning unless good reason can be given to alter that meaning. In this case, the common meaning of “ image” is “likeness” or “resemblance,” and it is used that way every time in the New Testament. Many have questioned the Greek word here, “Χριστος” (Christ), because they cannot see how Moses would have any knowledge of him. Let’s first keep in mind that this word means “anointed”. It also can be said that it was just as easy for God to reveal Christ to Moses, as it was for him to reveal him to Isaiah, or to the shepherds, or to John Baptist; or to manifest him in the flesh. Some think this passage refers to Jesus speaking to human beings in hell after His death on the cross. Others think it refers to Christ’s spirit speaking in the days of Noah to warn of impending judgment and offer salvation to Noah and his family. Neither is correct or biblical. First, nowhere in the Bible is there any statement that a lost soul who has died can have a second chance in the afterlife (Heb 9:27). God has provided this earthly life as the place were all human beings determine who to obey and how they plan to spend eternity. That decision is made by each individual based upon personal conduct (Matthew 16:27; John 5:29, Rom 2:6-10, 1 Corinthians 3:8). Once a person dies, his eternal destiny has been cinched. He is “reserved for judgment” (2 Peter 2:4, 9, 17, 3:7, Hebrews 9:27). Second, This passage does not claim they were in “hell.” The most likely interpretation of “the spirits now in prison” is similar to those who were slaves to sin in Noah’s day. Just as it was in the days of Noah, when God spoke through other men, Jesus now preaches (through men) to those spirits imprisoned by sin (those individuals who are spiritually dead, because of sin). This passage is talking about living people, not people who have died and are in hell. Third, this would present several other problems. Why would Jesus go and preach only to those in Noah’s day? Why would Jesus exclude those who died prior to the flood, or those who have died since, and not give every dead person a second chance? Since God is no “respecter of persons” (Acts 10:34; Romans 2:11), God would not have Jesus go and single out Noah’s generation to be the only recipients of this preaching (Gospel) in the spirit realm. And finally, what would have been the content of such preaching? Jesus could not have preached the whole Gospel in its entirety. The Gospel includes the resurrection of Jesus (Romans 4:25; 1 Corinthians 15:4). However, at the time this preaching was supposed to have occurred, Jesus had not yet been raised! Let’s look at another companion verse that is also used to support this same claim that Jesus entered hell after His death on the cross. The view of Jesus descending to hell is further negated by the words of Jesus Himself. Just before His death, Jesus said, “Father, into your hands I commit my spirit” (Luke 23:46). Upon death, His spirit, as all human spirits, went to the Father, not hell (Ecc 12:7). Jesus’ body was in the grave dead (Rom 10:9, Gal 1:1, 1Peter 1:21, Rev 1:18) for three days (Mark 8:31), not hell. Christ did not exist during this time period (the days of Noah) especially if we acknowledge Jesus as the “true” seed of David; that is also why Jesus is not mentioned in the Old Testament. The transliteration of this passage is confusing the way it has been presented in the KJV, as it is with many other versions. 20 Even as Yahweh, to the disobedient when the patience of Yahweh was waiting in the days of Noah, while an ark was being prepared, in which a few, that is, eight persons, was carried safely through the water. 22 Who has gone into heaven, and is at the right hand of Yahweh; malakim, authorities, and 8powers having been made subject to Him. 20 Even as God, to the disobedient when the patience of God was waiting in the days of Noah, while an ark was being prepared, in which a few, that is, eight persons, was carried safely through the water. 22 Who has gone into heaven, and is at the right hand of God; angels, authorities, and 8powers having been made subject to Him. 20 We know also that the Son of God (Jesus) has come and has given us understanding, so that we may know him (God) who is true. And we are in him (God) who is true by being in his (God) Son Jesus Christ. He (God) is the true God and eternal life. First, there are three pronouns (him, his and he) in this passage that we have to “correctly” determine who they are referring. It is the “He” in the last sentence that frequently causes some confusion because both God and the Son of God are mentioned in the same passage. But it is the context that determines to whom the phrase “true God” applies. The passage mentions “him that is true” two times, and both times it is clearly referring to the Father. Since this verse refers twice to the Father as “the one who is true,” that is a strong indication that “the true God” in the last part of the verse is the same being. Second, if holding the understanding that there is only one God and none else (No God the Son, or “God the…” anything else) (Isa 45:5-6) then this phrase “true God” should mean the same wherever it is written. The phrase “true God” is used four other times in the Bible (2 Chronicles 15:3; Jeremiah 10:10; John 17:3 and 1 Thessalonians 1:9) and in all four of these places, the “true God” refers to the Father and not the Son of God. Jer 10:10 But the LORD (H3068) is the true God, he is the living God, and an everlasting king: at his wrath the earth shall tremble, and the nations shall not be able to abide his indignation. Who gives eternal life? – The answer is, only the true God. John 17:2 As thou hast given him power over all flesh, that he (God) should give eternal life to as many as thou hast given him. How are we in Christ and in God at the same time? We are not literally inside the body of Christ or that of God. We are in (the will of) Christ when we are in (the will of) God (Mat 7:21, 12:50, John 14:23) who is the true God! In Revelation 1:4, 1:8 & 4:8 John makes perfectly clear that the phrase “which is and which was and which is to come” is attributed solely to God the Almighty, not Jesus Christ, who although is indeed mighty, he is certainly not the “Almighty” (John 5:19, 30, 8:28, 14:28, 1Cor 11:3, 1Cor 15:27-28). John goes on in Revelation 1:5 to add another person saying, “and from Jesus Christ, the faithful witness, the firstborn of the dead, and the ruler of the kings of the earth.” In doing this, John distinguishes Jesus from God spoken of in Revelation 1:4. Revelation 5:6 (ESV) And between the throne (of God) and the four living creatures and among the elders I saw a Lamb standing (Jesus Christ), as though it had been slain, with seven horns and with seven eyes, which are the seven spirits of God sent out into all the earth. Revelation 5:7 And he (Jesus Christ) came and took the book out of the right hand of him (God) that sat upon the throne. Therefore the one sitting on the throne is not Jesus, because in Revelation 5:6,7, we find Jesus depicted as the Lamb slain, who is found worthy to take the book from the right hand of the one sitting on the throne. In any passage of scripture, where we have a title (“the Almighty”) being used to identify someone, it is vitally important that we associate the correct individual to the title in reference. In this case, and in order to correctly understand (Revelation 1:8), we must first backup and start from the beginning of this book (Revelation 1:1) because it contains vital information and the necessary keys that will help us correctly identify who this title belongs to and who it does not. For those that teach Jesus is God, it is hard (if not impossible) to “soundly” explain how (Revelation 1:1) in conjunction with (Hebrews 9:24) could possibly indicate Jesus is God (outside of misreading these passages). What these passages do undisputedly depict is that even in heaven Jesus and God are definitely not the same person (or being). 1. How does Jesus receive a revelation from God if he is GOD? 2. How Do We Explain Jesus “APPEARING BEFORE GOD” For Us, If Jesus Was God? 4. John: Who in turn bares record of this revelation to the church at large. (Revelation 1:1-2) (KJV)– The Revelation of Jesus Christ, which God gave unto him, to shew unto his servants things which must shortly come to pass; and he sent and signified it by his angel unto his servant John: 2Who bare record of the word of God, and of the testimony of Jesus Christ, and of all things that he saw. (Revelation 1:1-2) (CEV) – This is what God showed to Jesus Christ, so that he could tell his servants what must happen soon. Christ then sent his angel with the message to his servant John. And John told everything that he had seen about God’s message and about what Jesus Christ had said and done. We can see throughout the book of Revelation that different individuals speak and are seen by John. The Bible tells us that John was in the Spirit ; whether this was a tangible face-to-face delivery or a vision we have only speculation nonetheless it says John bare record (he was a witness to it/ he saw it, heard it) (Revelation 22:8) and what he bare record of was that of God’s word and the testimony of Jesus. We can prove that God himself spoke to John (Revelation 21:5-7) it reads in part; “And he said unto me“, “I will be their God,” and “he shall be my son”. Unfortunately, this is NOT the throne of Jesus as many have so often mistakenly proclaimed. According to scripture (Hebrews 12:2), this is the throne of God and Jesus is seated [now] at the right hand of God’s throne. (Hebrews 12:2) – Looking unto Jesus the author and finisher of our faith; who for the joy that was set before him endured the cross, despising the shame, and is set down at the right hand of the throne of God. Of course as “Oneness” (or Trinitarian) we needed this verse to mean something different; claiming the “right hand” of God is figurative not literal, that Jesus is not (literally) seated at the right hand of God (of course the scripture says that he is). We say that it is reflective of the “power” of God or “favorite” position, which both are true statements, that however does not change the “location” (or position) of where Jesus is “placed” in relation to God his Father; Either way, it denotes Jesus in a position correlated to the position of someone other than himself. Note: John in his writing addresses the “seven churches” in Asia. John gives recognition to God the Father by addressing Him as, “Him who is and who was and who is to come.” (““…Him which is and which was and which is to come – KJV). Many Christians mistake this phrase as referring to Jesus without carefully reading the grammatical structure of the paragraph. The paragraph reads, “…Him who is and who was and who is to come AND from Jesus Christ.” The word, “and,” is a conjunction, which divides and separates. This alone PROVES Jesus is not the same as God, and later, in Revelation 1:8, this is verified. Secondly, John writes concerning Jesus by calling him, “the faithful witness, the first-born of the dead,” who, “released us from our sins by his blood.” God cannot die! Jesus has made his church to be a kingdom, priests, “to his God and Father.” How could Jesus be “God” in heaven if his kingdom belongs to, “his God and Father?” John says that Jesus released us from our sins through his blood, and made us to be “priests” to “his God.” A “priest” is someone that mediates or reconciles men to God; therefore a priest cannot be God. The paragraph numbering system did not exist in the original scriptures, we must realize that verse (5) is a continuation of verse (4) which begins “AND from Jesus Christ”. Therefore, John is telling us about two individuals, God and Jesus. In this verse John now tell us a little bit about Jesus Christ, the first begotten of the dead, how he has made us (kings and priests) unto God his father, and verse (6) closes with Amen (the end). In verse (7) John tells us who all shall see Jesus (everyone) when he comes (Revelation 1:5-7) and finishes again with Amen (so be it, or the End). Why is verse 8 not Jesus? Verse 7 says that He is coming in the clouds and those who pierced him will see him come. Why is verse 8 not this same Jesus? (Revelation 1:7) is indeed in reference to Jesus but John’s statement about Jesus starts at verse 5 and ENDS at verse 7 with his last AMEN (so be it, or the End). Both verses (Revelation 1:6 and 7) are separate statements about Jesus. This is not the case with (Revelation 1:8). This is a significantly different statement. Omega (o’-meg-ah); the last letter of the Greek alphabet, i.e. (figuratively) the finality. First – 4413 protos (pro’-tos); contracted superlative of 4253; foremost (in time, place, order or importance): Jesus is foremost in rank or order of importance in the plan of God for man’s redemption. The Father is Supreme and holds no rank because He alone exists as God. Last – 2078 eschatos (es’-khat-os); a superlative probably from 2192 (in the sense of contiguity); farthest, final (of place or time): Jesus is of foremost importance in the realm of time; even unto the finality of time (as we know it), or the earth and heavens (as we know them). For further reading regarding this concept, read 1 Corinthians 15:20-28 & 38-49. NOTE: Revelation 1:4 uses the identical phrase as 1:8, “who is and who was and who is to come,” when referring to God, neither of these applies to Christ Jesus. Remember however, that in Revelation Chp. 1 verses 4 -5 must be read together in order to easily identify and distinguish the conjunction word (“AND”) between that verse which is in reference to God (vs. 4) and the following verse which is in reference to Jesus (vs. 5). 1. This phrase “I will be his God, and he shall be my son” is either an indication of Jesus or God speaking. (We know Jesus never claimed anyone would be “his son” only God made that claim. The only other challenge lies in proving whether or not it was Jesus or God speaking). 2. Revelation 21:6-7 actually reflects undeniable evidence indicating that it was not Jesus speaking (whose spoken words are said to be reflected in RED) but God himself speaking. Word – 3056 logos (log’-os); from 3004; something said (including the thought); by implication a topic (subject of discourse), also reasoning (the mental faculty) or motive; by extension, a computation. Testimony – 3141 marturia (mar-too-ree’-ah); from 3144; evidence given (judicially or genitive case); here in Revelation 1:9 it is in the genitive case, and therefore means, “a witness.” Marturia comes from the root Greek word martus (mar’-toos); meaning, a witness (literally it is used judicially or figuratively it is used in the genitive case); by analogy, a “martyr.” Our English word for “martyr” is derived from the Greek root martus. God cannot be a martyr, since God cannot die! Thus we see the exact nature of the distinction between the “word of God” and the “testimony of Jesus.” Furthermore, in Revelation 1:2, 9, “the testimony of Jesus” is the announcement of the gospel; the preaching of Christ as determined by the apostle’s testimony (v. 2, “all things that he saw”). This testimony especially concerns Christ and is based upon a personal knowledge of him (Revelation 12:17; 19:10; 20:4). It is believed that the apostle John was Jesus’ closest friend during his ministry years. Many believe John is the apostle, “whom Jesus loved” (John 13:23; 20:2; 21:7, 20). If John was this close to Jesus, don’t you think he would know if Jesus was in fact “God” Almighty? His descriptions of Jesus throughout the Book of Revelation leave no room for doubt that Jesus is a man and not Deity. This is a figure of speech. It’s meaning is debated because the identity of God is not always clear. Alpha and Omega, in this passage, is clearly in reference to God, the Almighty. Note: This is one of those debated passages, as we are not directly given the identity of who is speaking in this passage, thus it is speculative. It depends on your position as to the true meaning of “Alpha and Omega, the first and the last,” which again is speculative. Since both could potentially hold the same meaning and arguably hold different meanings. It is argued that Jesus and God, at times, can hold the same titles, as explained above with the word “Lord.” (It can be argued that Jesus is the first born from the dead, the first and last atonement man will ever need, the Christ, etc… just as God is the first and only God that will ever exist, from the beginning of time to the end, etc.). In Rev 1:12 we then read John turns to see who the voice came from. This is where speculation comes into question because in Rev 1:8 we know the Almighty is God but in Rev 1:18 it reads “I am he that liveth, and was dead; and, behold, I am alive for evermore,..” which we know is not applicable to an Almighty God, but God raised Jesus from the dead (Acts 4:10, 13:30, Rom 7:4, 10:9, 1Cor 15:15, Gal 1:1, Col 2:12, 1Peter 1:21). Furthermore, Rev 1:11 does not conflict if we understand the voice coming from God, it still remains in harmony with all remaining passages. Although it can be argued, often because of the man-made (or added) Red lettering, it has not been proven false or in error. Note: A biblical analysis works to resolve controversial issues maintaining both “correctness” and overall “harmony” of all the scriptures, not applying scriptures in such a way that they would contradict or potentially conflict with each other, instead of harmonizing with each other. Similarly, if two writers present testimony that is contradictory, doubt is cast on the integrity of one or both records. Many have charged that the New Testament contains contradictions. Contrary is defined by Webster as “a proposition so related to another that, though both may be false, they cannot both be true.” Thus, the statement, “Joe and Bill are in this room” contradicts the statement, “Only Joe is in this room.” It does not, however, contradict the statement, “Joe is in this room.” Omission does not necessarily constitute contradiction. the phrase I am the Alpha and Omega is omitted, thus this passage is not at issue. Several published versions are listed below. 13 I am the First and the Last. I am the Beginning and the End. Note: However, even if Alpha and Omega were included, we would still come to the same conclusion. In Rev 22:1, 3 we can see there are two entities (or personages) being mentioned (and only one is called God, the other the Lamb) yet it is clear that the central figure in control is God. Rev 22:3 tells us that “his servants shall serve him” (1Cor 15:27-28) and Rev 22:4 says “we shall see his face (God); and his (God) name shall be in their foreheads (Rev 3:12, 14:1). But the confusion starts from Rev 22:13-14 which is argued as to who is speaking; it is either God or Jesus. This is further complicated because a few passages later we have Jesus clearly indicated as speaking Rev 22:16-17. Jesus comments (Rev 22:16 ) are separate following that of God’s. Again this is more factual than not and although it can be argued it has not been proven incorrect. It is also best harmonizes with scripture and God’s plan of salvation (1 Timothy 2:5; Hebrews 9:24, Acts 17:30-31). It is clear that a careful reading of the immediate content and surrounding passages must all be considered. Alpha & Omega are clearly associated with God. We therefore cannot just speculatively declare Jesus to any title that may belong to God (the Almighty, etc.) when it is not in the original writings as such. John was caught up into heaven and there he saw one seated on the throne; at least in reference to (Revelation 4:2) where only one throne is mentioned. Some argue that this throne belonged to God therefore only God existed and Jesus must be God since a second throne was not mentioned. Unfortunately they omit several things that must be made clear. (1.) First, we seem to be limiting the seating capacity of this throne (which belonged to God the Father), for Jesus was allowed to sit with God, on his Father’s throne (Revelation 3:21). (2.) Second, Jesus did not have to be God to have a throne given him from God. Nothing precluded God from having a throne for his Son Jesus, who is King of Kings and Lord of Lords and it was God who gave Jesus the throne of his father (or ancestor) David (Luke 1:32). The only criteria was for Jesus to overcome. Jesus said for those who overcome (as he did) they will be allowed to sit with Jesus on his throne (Revelation 3:21). Whether the thrones are literal or figurative is irrelevant, for a distinction is made clear nonetheless, God has a throne and Jesus has a throne given him from GOD. We can only speculate if the throne Jesus refers to as “my throne” is actually that which King David physically ruled from, or is it a metaphor or a different type of throne.